Dingo ­ barking threats while wagging her tail ­ simultaneously warns and welcomes newcomers who approach the white-domed observatory. She acts somewhat addled around the building; fifteen feet in diameter, the size of a big kennel, it doesn't function like most buildings. If she is addled, it is a feeling often shared by visitors after a few hours pondering the cosmos. Recently completed installation at Sterling Hill in Ogdensburg. Bill Kroth, Treasurer of the Sterling Hill Mining Museum in Ogdensburg, pads silently across the carpeted floor and fiddles with controls along the walls. Denise Kroth tugs Dingo to a spot by a space heater. A circle of red light shines from the floor while starlight pours in through the dome's viewing slot. The opening rotates with the sound of a forklift and shuts off abruptly. A different slice of sky appears overhead. Adjusting the focus and angle of a twenty-inch scope, Bill peers through the eyepiece. Jupiter glows in the small circle of glass ­ brightly enough to see the bands on its surface. Four bright moons, neatly aligned, float nearby. Visitors get a good long look before the earth moves enough to shift the planets out of view. The scope will be realigned until everyone sees Jupiter and its moons. Then it is time to continue with Bill Kroth's Tour of the Universe, where nothing is as it seems. Seated on the floor, Gordon Power leafs through a small guide to the stars. 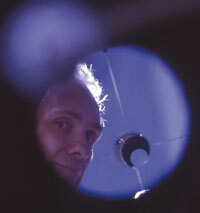 A mechanical engineer at Picatinny Arsenal, Gordon morphs into an avid astronomer at night. He gets to his feet and points to a small chunk of seemingly unoccupied celestial real estate. "It's over there," Gordon says. The two men reach for pen-sized lasers. Intense, narrow green beams of laser meet like dualing light sabers above the horizon. They hope to find an M-object, far-off objects that cannot be seen by the naked eye. "M-objects are named for Charles Messier," Bill explains. "He went looking for comets in the 1700s. To rule them out as comets, he catalogued over one hundred fuzzy, deep sky objects." Aiming the telescope, Bill finds M-104, the sombrero (named for its shape) galaxy in Virgo. "Its light left around the Ice Age." Trying to help, Bill offers a sense of perspective: "Light travels seven times around the equator in one second." This is not shopping-cart math. A short time later he finds a big galaxy. Scattered pinpoints of light, like Jackson Pollock throwing paint at the sky. Bill moves on to the M51 whirlpool galaxy. "You'll see more if you don't look directly at it," Kroth advises, and offers up a brief explanation about the rods and cones of vision. "Some of these objects are still low in the sky. Wait. It'll get better as the night goes on." Denise lets fly a comment about spousal promises. The men laugh. This is a happy crew. It is almost midnight; the self-professed science geeks have spent over two hours searching for exploded stars. If they are tired it does not show; they are far too pleased to see the telescopes out of Bill's living room and on the side of a hill. With the opening of the new observatory at Sterling Hill Mine, the facility's Earth Science program underwent a significant expansion. The trustees hope visitors will come for programs that include mining, star-, nebulae-, and galaxy-gazing, and a possible barbecue. 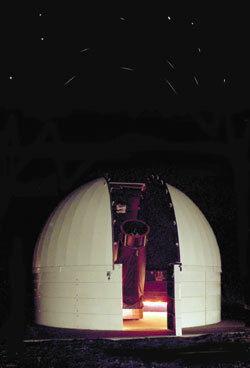 (A third telescope, designed for safe viewing of solar flares and prominences, is also available.) And with discoveries aided by the Hubble Space Telescope, astronomers have much to discuss: the age of the universe (billions and billions of years), the existence of "dark energy"; the discovery of small proto-galaxies, the existence of black holes. Hubble has also sent home approximately 70,000 images of nebula, galaxies, stars, planets, etcetera ­ some released this year to commemorate the telescope's fifteen years in orbit around the earth. In New Jersey, the northern regions offer the clearest, unobstructed view of the night sky. Planetariums at the community colleges remain bedeviled by light pollution. At Raritan Valley Community College, visitors climb steep flights of stairs to reach the Planetarium. The gift shop offers t-shirts, books, eclipse glasses and astronaut ice cream packs for sale, and poster-sized prints from Hubble, including an image of two weirdly beautiful, monolithic towers of cold gas and dust ­ light-years in length ­ that protrude from the Eagle Nebula. 6,500 light years away in the constellation Serpens, the "nearby" nebula offers a glimpse of the birth of stars. Another image from Hubble shows in stunning clarity and color the spiral galaxy M51, a "Whirlpool Galaxy" with newborn stars in its curving arms and older stars in its yellow core. Display cases offer 3-D depictions of the cosmos. Dangling balls represent the sun and planets of our solar system. A subsequent display shows two hundred and thirty four stars, including our sun; the next case replicates the Milky Way. Stiffened, stretched out cotton balls form a whirlpool shape caused by an estimated 200 billions stars spanning 110,000 light years. A teeny red dot approximates the location of our solar system. The last display ­ a large box with a grid ­ is an attempt to quantify 100 billion galaxies in the universe. Adults who make it to the last box seem to undergo unnerving mind bends. "OK. That's gi-normous," a man says, disconcerted by the magnitude. Families arrive for the planetarium show and claim seats in the dark theater. As the show begins, stars light up the ceiling. William (Bill) P. McClain, Science Educator from The Newark Museum, points out the Big Dipper and locates the north star. Stars wheel across the ceiling to display different seasonal skies. The kids laugh. Bill treats the audience to an hour-long tour of the skies. "All the stars in the visible sky belong in the Milky Way. We are 2/3 out, at the edge of an arm. We can only see a few thousand stars in our section of the spiral galaxy." As if that's not enough to grapple with ­ what exists past the edge of the universe, so many billions of light years away? Bill McClain laughs. "That's the question." Armed with some basic information, it is time to learn more first-hand. "Don't think of it as a border, or an edge," Bill Kroft says. Gordon leans over a notepad and draws a grid with a concave dip towards the center. "Space curves inward," Gordon explains. Bill ­ trying to be helpful ­ adds: "If you travel far enough, you'll see the back of your head." Heaven knows there is plenty to read up on: some theorists believe that many, parallel universes exist, reducing ours to part of a vast, ever-growing "fractal." And then there's the problem of the beginning, when the universe supposedly began with the Big Bang and space itself exploded. That only creates a new problem: how could space have exploded if it didn't exist yet? It is easy to feel like a bird which ­ after winging through seemingly dense woods ­ flies into reflecting glass. With no apparent rhyme or reason, space changed. And questioners are left with no language or ability to comprehend the event. Just in case seekers of The Truth should get comfy with some concepts, there is still the matter of Time. Without events, there can be no time; we can't ask what came "before" the Big Bang ­ at least not using any known physics. Preliminary forays into the Big Questions can result in empathy for addled Dingo. Bill and Gordon concede the failure of physics. "There is a lot we don't know," Bill says. The men discuss the possibility of multiple new dimensions. "What are we up to now?" Gordon asks. "Eleven?" 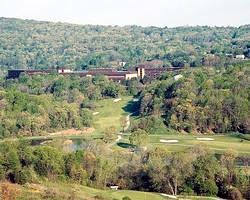 An evening at Sterling Hill begins simply enough; visitors park under empty relics of the mining site and follow a footpath to the side of a rocky hill. A guide unlocks the gate. (Guests facing the dark tunnel should be forgiven if they mention that family members know where they've gone. And who they're with.) Inside the hill, they get a glimpse of mining in the 20th century. Old tools, weights, wood boxes, mining helmets and displays with plastic mannequins illustrate the difficult work. A truly spooky tableau shows a dummy seated in a small wood car, about to descend twice the length of the Empire State Building into the dark. 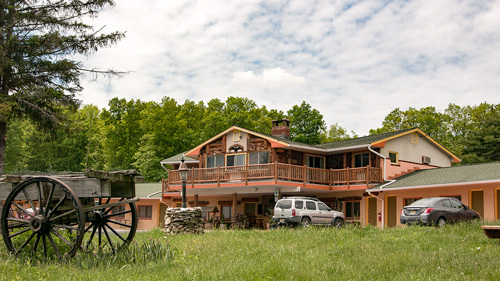 "There is no place like it on earth," Bill Kroth likes to point out. In various nooks and crannies ultraviolet lights point down at bland, gray walls of rock. Bill turns a switch. Suddenly bathed in black light, the walls glow vivid green, yellow, red and blue. The area contains 80 types of fluorescent minerals. The Sterling Hill Mine in Ogdensburg, N.J., houses one of the world's preeminent deposits of fluorescent minerals. Museum ­ crystals, minerals from around the world. An interest in stars seems a logical extension in a place that collects and sells unusual minerals: dig deep and aim high, for jewels in the ground and jewels in the sky. The trustees enjoy the science of it: the physics, geology, astronomy ­ even the mechanics. It becomes clear when they discuss the various telescopes. Donated by a supporting member, Dr. Warren Miller of Neshanic Station, the 12 1/2" reflector telescope offers photographers a chance to take photos of the skies. Once aligned with the north pole star, it tracks objects as the earth moves. In his element, Bill Kroth explains how one telescope's parabolic mirror sends a conical beam to another mirror, which projects light 90 degrees to the eyepiece. The mirrors are hand-finished. To get a parabolic curve, grit and water get placed between two pieces of glass. Circling the glass, the craftsman slides the top piece over the bottom to create a spherical surface. The glass is repeatedly dished and tested for a true parabolic curve. The process sounds decidedly clever and extraordinarily difficult. Even the Hubble Space Telescope had problems with an improperly ground mirror. "Sir Isaac Newton figured this out in the 17th century." Gordon Powers laughs. "Remember, this is the man who invented calculus." When all is said and done, Bill Kroth and fellow board members hope the observatory will attract members to the new club. They will continue to track celestial objects; this summer will provide other opportunities, such as a chance to check out NASA's project, Deep Impact. On July 4th a probe will intercept the comet Tempel 1; barring cloud cover, the impact will be visible from earth. Then there will be a chance to see the Perseids, a meteor shower in August, followed by the Orionids in October, the Leonids in November and the Geminids in December. This autumn the earth will pass close to Mars ­ not as closely as in 2003, when gap shrank to the smallest in 60,000 years ­ but close enough. By late fall, Saturn will reappear in the night skies. So much star-gazing begs the question: are we utterly insignificant, the lint in Nada's pocket, or are we stunningly unique? Does other intelligent life exist in the universe? Are we angels on the head of a pin? Is there intelligent life out there? Gordon shakes his head. "It doesn't seem likely," he says. "Alot of things can go wrong." "But with billions upon billions of stars, the odds seem good that other life forms exist," Bill says. The two men offer a last crash course. In essence, the universe is composed of 99 elements. Time and space might not be what they are, but the Period Table of Elements is what it is. And we are made of those same elements. "It's pretty neat," Gordon says. Indeed. One is what one has always wanted to be. A heavenly body. A star. Not-for-profit, the Sterling Hill Astronomy Club offers individual memberships for $25 and $35 for families. Visit and view on a monthly basis, generally Friday or Saturday nights. The observatory is also available for school groups, scouting groups, and private astronomy birthday parties. Special celestial events are also scheduled for viewing. Stay updated at the Sterling Hill website, / Or email questions. The United Astronomy Club of New Jersey offers free public programs on Saturday evenings through October at their observatory at Jenny Jump State Forest in Hope. An astronomy presentation is followed by an observing session, weather permitting. Their Annual Symposium is held in late September for individuals who wish to learn more about amateur astronomy as well as having topics for more advanced amateurs. The programs include both general and technical presentations. At Voorhees State Park in Glen Gardner, the New Jersey Astronomical Association has installed a 26-inch Newtonian reflector telescope, one of the largest privately owned telescopes in New Jersey.The public is invited to explore the night sky at skywatching programs that are offered year round by the NJAA. For further information, call (908) 638-8500.